When you wake up onboard Royal Caribbean's Harmony of the Seas, you will probably be wondering where you can get something to eat to start your day. There are some obvious choices, but there is also some other options less passengers visit too. Depending on what you're in the mood for, there is something for everyone. The all-encompassing Windjammer Marketplace is the most popular choice for breakfast, primarily because it offers the greatest variety of food. For families or just groups that can't all agree on one thing, this is the best option. There is so much to choose from and also has a rather large seating area. The Windjammer is also a very popular choice, so it tends to get the most crowded of any breakfast location available on Harmony of the Seas. During prime breakfast hours on sea days, it can get quite busy and lines to find a table are not uncommon. Located in Central Park, Park Cafe is a great alternative to Windjammer because it has a mix of pre-prepared and freshly made breakfast choices. While Park Cafe may not have the variety of choices that the Windjammer does, it does also include some breakfast stations not found anywhere else on Harmony of the Seas. The menu here offers a little of everything, including a full bagel bar. There's also cereal, pastries, and some hot breakfast items. Did you know that Johnny Rockets on Harmony of the Seas is complimentary for breakfast? All Oasis-class ships offer this option, but many guests are unaware that breakfast is served here, nor that it is included with your cruise fare (Johnny Rockets has a cover charge for lunch and dinner). The Johnny Rockets breakfast menu on Harmony of the Seas is a traditional American breakfast, with pancakes, omelettes, French toast and the like. In fact, Johnny Rockets is one spot onboard Harmony of the Seas to get omelet made-to-order. Johnny Rockets tends to be not very crowded for breakfast, because many guests are unaware of this option, and it also has a large seating capacity (indoor and outdoor seating options). Perhaps the fastest breakfast option that is not named "Windjammer" would be the Mini Bites station on Deck 15. Mini Bites is kind of like a hotel hot breakfast buffet that merged with the Windjammer. One particular distinction of Mini Bites is that it offers a custom omelet station. Whether you choose to enjoy your breakfast at one of the many tables nearby, or take it elsewhere on the ship, Mini Bites is a great choice for someone that wants to get something hot and quick. For fans of the main dining room breakfast experience, American Icon Grill is the next best thing. Having breakfast at the American Icon Grill means you will be seated at a table (sometimes with other guests) and order off a set breakfast menu. What attracts most people to breakfast at the American Icon Grill is the table-service experience that is more formal than a buffet. As such, keep in mind that a breakfast in American Icon Grill is designed to be a bit more leisurely, so those looking for a grab-and-go option may want to dine elsewhere. Just like the Windjammer, it can get busy here too during peak dining times. If you happen to be staying in a suite while on Harmony of the Seas, there is a dedicated spot to enjoy breakfast just for you. Coastal Kitchen is a complimentary restaurant that is open to suite guests exclusively. For breakfast, it is only available for guests staying in Sky or Star Class suites and is similar to the main dining room experience in terms of it being a relaxed, sit down environment. As a suite guest, the appeal of Coastal Kitchen is that it is your exclusive spot onboard Harmony of the Seas to enjoy breakfast without the crowds. For something "off the beaten path", try the Solarium Bistro on Deck 15. The Solarium Bistro offers a buffet, but the options vary from what you might find at the Windjammer and it tends to be less crowded than some of the other spots mentioned earlier. What we like about Solarium Bistro is the fact it is less crowded than the Windjammer or Park Cafe, yet offers a good variety of breakfast choices that should satisfy most palettes. If your idea of breakfast is coffee and a croissant or donut, then head down to the Royal Promenade and grab something quickly at Cafe Promenade. Danishes, croissants and muffins are the kind of quick grab-and-go breakfast options available (along with a cup of coffee). Cafe Promenade is great if you are running off the ship for a shore excursion or just want something simple. What's your favorite spot for breakfast on Harmony of the Seas? Share it with us in the comments below! Royal Caribbean has packed Harmony of the Seas with a vast array of activities and things to do, including plenty of entertainment that is included with your cruise fare. Certainly there are lots of optional dining, gaming and indulgent add-ons that come with an additional cost, but if you want to keep your onboard spending account low(er), then we have a list of our favorite complimentary things to do onboard. We picked the ten complimentary activities that we really enjoyed, but there is plenty more provided on Royal Caribbean's head-turning ship. Without further adieu, here is our top ten favorite free activities on Royal Caribbean's Harmony of the Seas. Broadway shows have a reputation of being expensive, but Royal Caribbean has included this all-time favorite Broadway show in the cost of your Harmony of the Seas cruise fare. Grease is the full Broadway production, and features a soundtrack of crowd favorites such as “Summer Nights,” “Greased Lightnin’,” “Look at Me, I’m Sandra Dee,” “Born to Hand-Jive,” “Beauty School Dropout” and more. Royal Caribbean's Adventure Ocean program has won many awards over the years for providing the very best supervised kids programming at sea. On Harmony of the Seas, there is one of the largest Adventure Ocean spaces to date on any Royal Caribbean ship. Kids are a big part of the cruise experience on Harmony of the Seas, and parents can rest assured that their children are having a fun time in a supervised environment, with plenty going on. Kids will love the array of fun activities onboard and parents will enjoy some time apart from the kiddos! Onboard Harmony of the Seas, you will find two FlowRider surf simulators on the aft of the ship, where you can try your hand at stand-up surfing or boogie boarding. The FlowRider has become an incredibly popular activity on Royal Caribbean ships, both to experience as a participant or as a spectator. The FlowRider is a complimentary activity, where you simply need to line up and wait your turn to ride. In addition, Royal Caribbean offers private and group lessons for a nominal fee, if you feel the need to learn quicker. Royal Caribbean offers passengers the opportunity to zip line 9 decks above the ground, stretching 82 feet from end to end. Passengers must be at least 52" tall to participate and weigh a maximum of 275 pound, also must at least weigh 75 pounds. The zip line is free and guests must sign a waiver. The AquaTheater on Harmony of the Seas is the distinct high diving, acrobatic performance space introduced by Royal Caribbean with the Oasis class of ships. It features two 10-meter high platforms and the hydraulic-floored pool, the largest and deepest freshwater pool at sea, below serves as podiums for high-diving, hair-raising aerobatics that AquaTheater audiences have come to love. There are two signature complimentary shows performed in the AquaTheater, The Fine Line and Hideaway Heist. The Fine Line is all about high-flying feats, mind blowing stunts and physically demanding acrobatics brought to life by the world’s best extreme-sport athletes. Hideaway Heist is an action packed aqua show that combines amazing wows and some laughs. If you had to list the most exciting new features coming to Royal Caribbean's Harmony of the Seas, the new water slides have to be near the top of that list. Harmony of the Seas is the first Oasis class ship to have water slides and are included in your cruise fare. There are three slides, two racer slides and a champagne bowl slide. The slides descend three decks through a series of twists and turns over the ship’s tree-lined Central Park neighborhood 10 decks below. Speaking of slides, the thrill experience on Harmony of the Seas is the Ultimate Abyss, which is the tallest slide at sea. The Ultimate Abyss is more than 150 feet above sea level and offers side-by-side slides that send guests down 10 decks at a rate of 9 miles per hour. Launching onto the ride from a glass platform, guests can take one last look at the Boardwalk 10 decks below before climbing onto a customized mat and taking the plunge into the depths of the daunting slides. There is no cost to ride the Ultimate Abyss, which means plenty of time to scream down the slide, over and over again. Royal Caribbean has built a reputation for producing some truly wonderful ice skating shows on its ships, and Harmony of the Seas has the best ice skating show we have seen on any Royal Caribbean ship, 1887: A Journey in Time. 1887 is a brand new show by Royal Caribbean Productions that is about love and adventure and is best described as a, "steampunk styled ice show." There is no cost to see 1887, although we do recommend reserving a spot for the show via the complimentary reservation system in Royal Caribbean's Cruise Planner. For kids, Royal Caribbean has completely reimagined its pool deck offerings that are intended for the younger crowd. On Harmony of the Seas, there is a brand new "aquatic adventure park" known as Splashaway Bay. Splashway Bay has plenty of splashing, with fountains, buckets, sprays and even slides for kids to enjoy to their heart's content. Splashaway Bay was built to be a focal point of the pool area, and offer yet another improvement on what the cruise line has been known for in the past. Like all the pool deck fun, Splashaway Bay has no cost to use, and is certain to be a very popular spot with your kids. In the Boardwalk neighborhood, guests young and old can enjoy a ride on a classic carousel that is sure to bring a smile to anyone's face. The carousel on Harmony of the Seas is hand-crafted and especially designed by Carousel Works for Royal Caribbean and is one-of-a-kind. Inspired by turn-of-the-century carousels that were found in the northeastern United States, Harmony of the Seas' carousel is a classic attraction that is as beautiful in design as it is enjoyable to ride. Royal Caribbean has introduced a new menu highlighting artisanal ingredients at 150 Central Park onboard Harmony of the Seas, Allure of the Seas and Oasis of the Seas. A straightforward multi-course which allows the guest to explore the restaurant on multiple visits and try something new each time. Selections include lobster gnocchi with carrot butter sauce, herb salad or Bittersweet Chocolate Bourbon Tart with salted caramel, spiced pecans, cranberry chutney and chantilly cream. A world-class cheese cart, tuna tartare or an 18-ounce tenderloin prepared tableside. Set in the Central Park neighborhood, 150 Central Park has a $45 cover charge, and includes from a variety of appetizers, entrées and dessert including a tableside cheese cart. 150 Central Park is the creation of James Beard Award-winning chef Michael Schwartz. Families going on Royal Caribbean's Harmony of the Seas are certain to spend a lot of time at the pool deck and very likely taking multiple rides down the water slides. Dubbed, "The Perfect Storm", these three water slides provide plenty of fun and thrills during any Harmony of the Seas cruise. If you want to ensure you get as many rides in and go as fast as possible, follow these tips for getting the most out of the Harmony of the Seas water slides. Waiting in line is never fun, but the popularity of the Harmony of the Seas water slides may leave much choice. It is important to note that the shortest lines for the water slides will occur at two times of the day. Check the Cruise Compass for exact times of operation, but try to ride the water slides in the morning when they first open and/or in the evening when many guests are having dinner. Both of these times will result in much shorter lines. The late-morning and afternoon are the peak times for the water slides, so expect a longer wait if you want to ride during those times. If you have a need for speed, the key is to wear as little clothing as possible. The more clothing you wear, the more friction between you and the slide. Rash guards, t-shirts and "ornate" bathing suits are all the kind of swim wear that will slow you down. Fashion opinions aside, Speedo swimsuits for men are the ideal bathing suit for attaining top speed on Harmony's slides. Speaking of going fast, regardless of what you wear on the slide, be sure to cross your arms and and legs to get maximum velocity. The physics of the slide favor those that reduce their body's drag against the slide, and the crossing one's legs and arms will ensure the best overall experience from start to finish. There are three water slides on Harmony of the Seas, and it is absolutely worth your time to try all three. There are two racer slides and a champagne bowl slide. Each slide differs from the others, so be sure to try them all. Speaking of trying them all, between the two racer slides, many guests we spoke to reported the blue slide is a bit faster ride down than the yellow slide. It is hard to quantify in written form, but see if you agree about the blue versus yellow slide's intensity. Do you have a tip for anyone riding the Harmony of the Seas water slides? Share them in the comments below! Royal Caribbean's Harmony of the Seas has a lot to offer, including a number of staterooms. Today, we will look at the category B1 Boardwalk View Stateroom with Balcony, which will take you through the cabin to provide an idea of what to expect if you book this category stateroom. On Harmony of the Seas, we reviewed stateroom 9723, which is located on Deck 9 aft, fairly close to the end of the hall. In fact, it is just four staterooms away from the end of the deck. Entry to the room is by RFID scanner, which is above the door handle. Walking into the room, you will immediately see the light from the balcony shining ahead of you. The bed is joined together but can be split apart if need be. There's a large, flat screen television across from it and two night stands on opposite sides of the bed. Access to the balcony is also on the other side of the bed. Across from the bed is a widescreen, high definition television. Beyond the bed is a large sofa, with desk and chair opposite it. This is where the bulk of the indoor living space is located and the room offers a good amount of space to navigate between objects and other guests. A B1 stateroom features a full bathroom as well with stand up shower. Of course, the reason to book this stateroom is the balcony. The balcony provides a full view of the Boardwalk neighborhood, and a partial view of the AquaTheater. The balcony is 47 square feet in size, with the stateroom measuring 182 square feet. There is certainly enough room for two adults to enjoy the space together. In fact, there is a lot of storage space provided in this room, which is more than the storage space provided on Oasis of the Seas or Allure of the Seas. Watch a hyperlapse tour of the world's largest cruise ship, Harmony of the Seas, now sailing out of Port Everglades, Fort Lauderdale. Royal Caribbean's Harmony of the Seas is a massive cruise ship, packed to the brim with lots of things to see and do. With a ship that large, it can be easy to miss a few diamonds in the rough. Having sailed on Harmony of the Seas, here is our list of best hidden secrets that can be missed on Harmony of the Seas. Oasis class ships are known for their bridge wings, which offer small observational platforms on either side of the ship that extend away from the ship's main structure, to provide one-of-a-kind perspectives. The bridge wings are located on deck 14 of the Solarium, at the very front of the ship and are accessible at any time by simply walking to them. Keep in mind that each bridge wing is different from the other. The port bridge wing has a see-through floor panel in one point, which allows a guest to see directly down to the ocean below them. The starboard bridge wing does not have the see-through panel, but does have a telescope. The bridge wings are accessible from the Solarium, but there is a lesser-known means of getting directly to the port bridge wing without going to the pool deck first. Go to the port side of deck 14 and walk all the way forward. At the very end of the hallway is a door that leads to the Solarium, and the port bridge wing. A ship the size of Harmony of the Seas might have some guests concerned about getting around, but Royal Caribbean color coded the stairwells to make it easier to quickly know if you are where you should be. There are 4 color codes to help guests quickly understand where they are. A wall in each stairwell will have these colors, which makes it easier to know if you are in the right stairwell for you. If you want to enjoy the aft view of the ship, Royal Caribbean has set up a space for you. On the jogging deck (deck 5), there are a number of chairs set up at the rear of the ship that provide a great view of the ocean. This area doubles as an usually quiet spot to relax too. 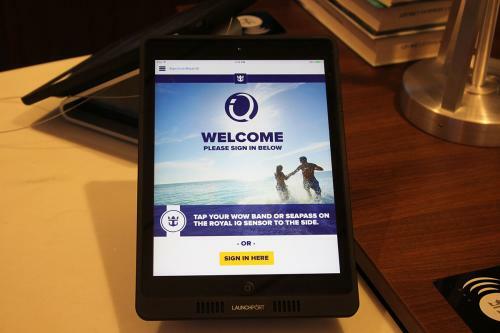 Have you heard about Royal Caribbean's RFID bracelets that work just like a SeaPass card, but with far greater convenience? You might see some guests wearing them on Harmony of the Seas and wonder how to get one for yourself. There is just one place onboard to get a WOWband, and that would be Guest Services on the Royal Promenade. At any point in your cruise, go there and ask to purchase one (or more). There are 4 colors, although the colors are tied to your muster station, so you will be limited by that requirement as to which colors you can use. The cost for a WOWband is $4.95, although you can bring them back on future cruises that have WOWbands enabled and exchange them for a new one without any additional cost. Harmony of the Seas features 3 very fun water slides that guests can enjoy time and time again, but if you want to get down these slides as quickly as possible, here are two important tips. First, cross your arms and legs while going down the slide. In all cases, the least resistance in the water (and slide) that you have, the faster you will go. Second, the least amount of clothing you wear will result in faster speeds. Rash guards, t-shirts and more elaborate swim suits will result in you slowing down. In fact, the crew members say for optimal speed, men wearing a Speedo swimsuit would be ideal. Harmony of the Seas is one of the few Royal Caribbean ships to make use of the smartphone application, Royal iQ. The app has a number of useful features, including being able to check the Cruise Compass, manage dining reservations and book shore excursions. Even if you are not paying for an internet package, you can still use the Royal iQ app. Simply download the app before you get onboard the ship and then start using it once connected to the Royal Caribbean WiFi network. All the app's features, minus the chat and call feature, will be available for use throughout your cruise. Embarkation day can lead to lots of guests wanting to get something to eat as they get onboard their cruise. As a result, popular spots like Cafe Promenade and the Windjammer are frequently crowded. There are two great spots to avoid those crowds on embarkation day and still get a great selection of choices for lunch. Both venues have some really good choices and are complimentary. Whether you are watching a DreamWorks parade or the Let's Celebrate parade, the best spot for seeing as much of the fun as possible is going to be right in front of Sorrento's. The complimentary pizza restaurant has lots of space to enjoy the show, and is situated at the center of the entertainment. While these events have the word "parade" in the titles, they tend to be events where the entertainment deploys to a certain area, performs and then marches around before exiting. The bulk of the entertainment occurs while they are deployed to a certain area, and being in front of Sorrento's will be the perfect spot to see it all. Many guests likely have the Ultimate Abyss slide near the top of their must-do lists, but if you do go for a ride (or four), make very certain you keep your elbows in to avoid a nasty scrape. Due to the high rate of speed experienced on Ultimate Abyss rides, you will want to make very certain to keep your elbows in and legs straight. If part of your arm comes in contact with the slide during the ride down, it can result in a rather painful bruise. Did we miss any Harmony of the Seas secrets? Share them in our comments! At long last, Royal Caribbean's Harmony of the Seas had her official naming ceremony over the weekend, with a spectacular naming ceremony that starred the ship's Godmother, a "hometown hero" in Education, Brittany Affolter. The event took place onboard Harmony of the Seas, and included Affolter, as well as singer-songwriter Jon Secada. The two took turns during the event to celebrate the ship's official arrival in her new home. The ship's Godmother, Brittany Affolter from Teach For America Miami-Dade, was selected as Godmother of Harmony of the Seas for her work in inspiring South Florida’s next generation to dream big, think differently and challenge the status quo. Royal Caribbean conducted a six-week search and received nearly one thousand nominees for the honor usually reserved for celebrities and royalty. As with all traditional maritime namings, Royal Caribbean smashed a bottle of champagne on the ship, as part of the inauguration process. To cap off the evening, an array of fireworks filled the sky over Port Everglades in commemoration of this special day. With Harmony of the Seas now in her new homeport, she will offer seven-night Eastern and Western Caribbean itineraries throughout the year. 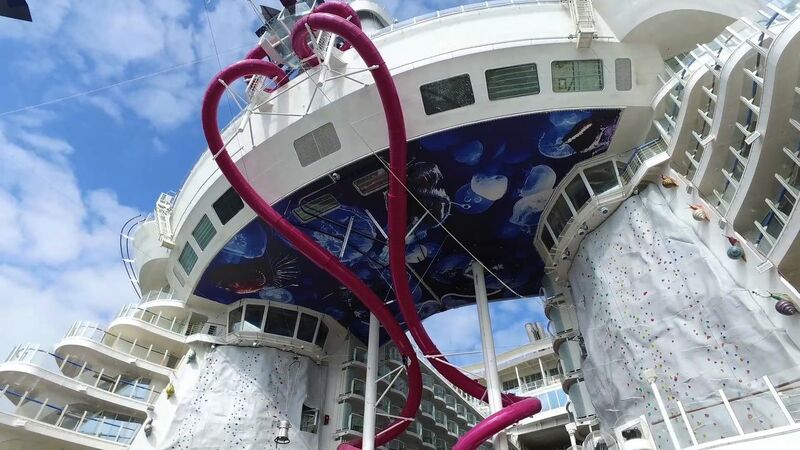 Perhaps no other feature or activity on Harmony of the Seas has garnered as much attention, intrigue and excitement as the Ultimate Abyss slide. Towering 150 feet above sea level, it is a dry slide that sends guest plummeting down a 100 foot drop. To say it is a thrill ride would be an understatement. We felt it was our intrepid duty to try this gargantuan slide out ourselves, and report back what it is all about. The entrance to the Ultimate Abyss is located on deck 16, near the very back of the ship. It is in between the two FlowRider surf simulators and can be found by simply walking all the way to the aft of the ship on deck 16. There is no means of signing up in advance, simply enter the queue when the ride is open and wait your turn. In addition, there is no waiver to sign to participate. As you get closer to the entrance, you will be instructed on how to ride properly. The important thing to know is to keep your elbows in and legs straight. Not following these instructions can lead to a nasty (and painful) burn on your arms during the ride. Right before climbing the stairs to the slide entrance, guests will take a mat that they will ride in. At the top, the mat is placed at the very beginning of the slide, and the guest will enter the mat, placing their feet and most of their legs in the mat opening. Then, grab the mat handle, lean back and head down when instructed. During the ride, guests descend at a rate of up to nine miles per hour, through a variety of twists and turns. While the slide is dark inside, there are spontaneous audio effects played at different parts of the ride, along with lighting effects. All of this combines to provide a multi-sensory thrill. At the conclusion of the ride, you will come to a stop along a long straightaway on the Boardwalk. Step out, grab the mat and place it in the receptacle for used mats. There is an on-ride photo option, where guests can get a photo of themselves that is taken just as they are about to end the slide ride. The Ultimate Abyss lives up to its billing as a multi-sensory thrill ride. Most guests that ride agree it is not as scary/intense an experience as one might think by looking at the slide. The amount of turns, and the angles at which they occur, contribute to slowing guests down to a pace that is far more tolerable than a simple plunge. It is quite common to be apprehensive at the top of the slide, but we found the ride down to be slower than we expected (which is not a bad thing). Rides on the Ultimate Abyss are complimentary, and offered during most times of the day. Lines certainly can develop for the Ultimate Abyss, especially on sea days and in the afternoons. To ensure a short wait, try to ride just as the ride opens or during dinner hours (after 5pm). Ultimate Abyss is a lot of fun to ride, and definitely worth a few rides over the course of a cruise. It is easy to get apprehensive about the experience, but the ride is big on fun and not as intense as one might imagine. Royal Caribbean's partnership with DreamWorks Entertainment has provided opportunities for guests to meet characters from the popular films on its cruise ships, and we spotted on Harmony of the Seas two new characters that guests can meet from the newest film, Trolls!. Guests were able to meet Poppy and Branch from the new animated film, prior to the 3D movie premiere in the Royal Theater on the ship. In addition to the characters, guests could pose for a photo in one of the cutout head displays to make themselves look like a troll.